Good looking upright growing very floriferous Crape Myrtle. The large trusses of flowers born in August – October are a fascinating mix of colors. In cooler weather they are decidedly rose colored, The hotter the weather and the more consistently hot the flower color becomes a rich red. 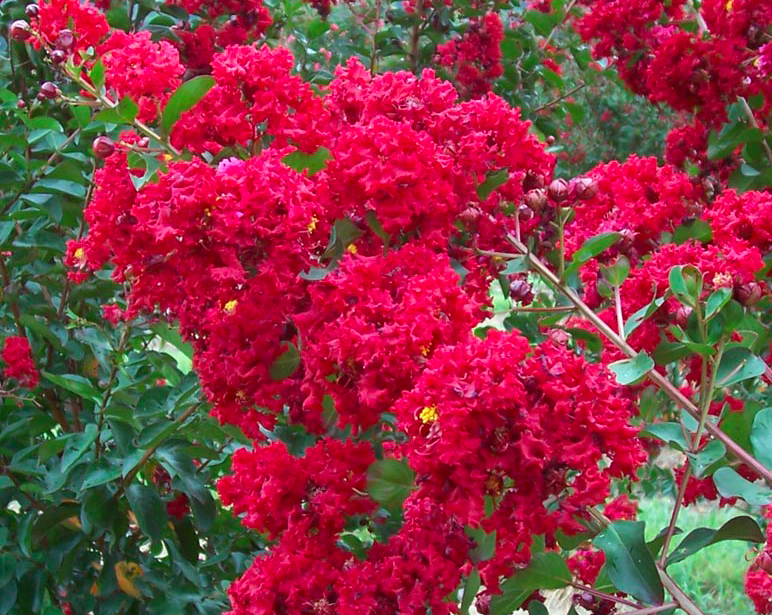 Either way this strong growing disease resistant Crape Myrtle is a winner in our climate. 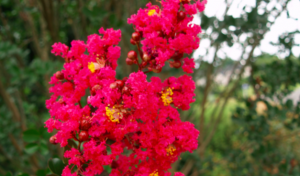 To 18′ tall and 9′ wide in full sun, virtually any soil with REGULAR deep irrigation in summer- without irrigation Crape Myrtles in our climate will stall and not grow or bloom. Fantastic garden tree. Fall color is red/orange and the bark exfoliates to a muscular soft tan/taupe. Grows 2′-3′ a year when well irrigated. Cold hardy. Not the best picture, but the truest flower color I could capture. Great Crape Myrtle.